These were the ingredients chosen to create the perfect snow day at K-State. But President Myers accidentally added an extra ingredient into the concoction: road salt. 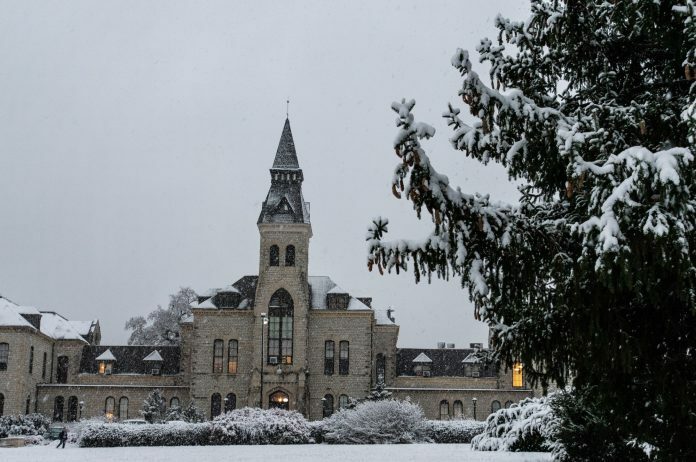 After a night of uncertainty on whether classes would be canceled at Kansas State University, the university announced early Thursday morning that classes will proceed as scheduled at its Manhattan and Polytechnic campuses. The Olathe campus will be closed until noon Thursday. K-State Alerts: The Manhattan and Polytechnic campuses are open. Olathe campus will be closed until noon. If it is not safe to travel, notify professor/supervisor. Students and staff who have concerns about the safety of their travel should contact their professors or supervisors, the university said. Wildly changing weather across the state over the past week has kept each day interesting, to say the least. Subzero temperatures a week ago yielded to breezy, upper-60s temperatures over the weekend. But since Wednesday morning, freezing drizzle made for slick sidewalks at K-State, and a thunder ice storm hit Manhattan late Wednesday evening, icing over much of the state as well. Since 3 p.m. Wednesday, the National Weather Service put Manhattan and northeast Kansas under a winter weather advisory until noon Thursday. K-State was a lone holdout going into Thursday morning as schools across the state, like Emporia State University and Washburn University, canceled early Wednesday evening, later joined by Wichita State. At the University of Kansas, all Thursday classes have been canceled. With frigid temperatures and wind chills dipping well below zero today, do what you can to avoid going out. Maybe heat up a cup of hot cocoa and read a good book instead. Editor’s note: This story has been updated to reflect KU’s class cancellation change, which the university announced at 7:42 a.m. Thursday. Originally, KU classes before 10 a.m. were canceled.